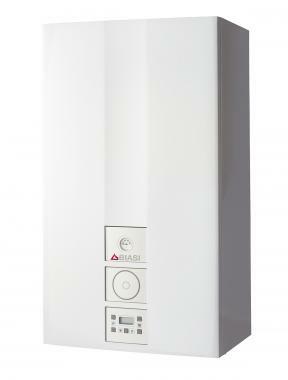 The Advance System gas boiler is made and manufactured by Biasi and designed to be both powerful and energy efficient. It is a wall mounted unit which uses condensing technology to deliver efficiency of 89% making it an A rated appliance. This boiler has an output rating of 25kW, making it perfectly suited for the smaller to medium sized homes that do not have a high demand for hot water or heating. It is also available in a 30kW output for larger homes with a higher demand. The boiler includes a variety of features and benefits to help it achieve such a high efficiency. For example, the high grade stainless steel single coil heat exchanger is extremely robust as well and comes with a single coil oval section which allows the water to flow freely and reduce dirt and debris. The visible pressure gauge and simplistic controls with the option of a switchable mechanical clock result in a boiler which is easy to use. The weather compensation feature means the boiler can react to the temperature outside and adjust itself accordingly which means better comfort in the cold and no wasted energy in the warm. This highly reliable boiler is a System boiler which means it directly heats your central heating system and produces hot water for a storage cylinder. Most of the important parts of the system, such as the pump and expansion vessel, are built in on a system boiler making it quicker and cleaner to install. This also means you get a faster response to demand for heating and hot water and you don't need to have a feed and expansion tank in the loft. This boiler features a 5 year warranty that covers parts and labour so you can be sure that this boiler will not let you down.